Poole, Dorset, April 16, 2018 – Ibcos Computers Ltd., a leading business management software supplier for agricultural, groundcare, and construction dealers, is proud to announce its new Gold Service application for tablets and smartphones, designed to help dealers improve their workshop productivity, cut down on equipment costs and bolster their bottom line. Another Ibcos customer, Julian Folkes, the Service Administrator at Compass Tractors Limited, called the app “a vast improvement” over the workshop scanners they were using previously. 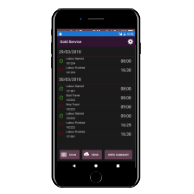 Dealers who are curious about Ibcos Gold or wish to add the Gold Service app to their existing software package can do so by visiting our website at www.ibcos.co.uk. In 2012, Ibcos was acquired by Constellation Software Inc. (TSX: CSU) – an international provider of market leading software and services to a select number of industries, both in the public and private sectors. Constellation’s mission is to acquire, manage, and build market-leading software businesses that develop specialized, mission-critical software solutions to address the specific needs of particular industries.